What a fabulous story, Robin. What a great reminder of how are lives are often touched by those we least expect it from. You have met some truly wonderful people in your life’s journey. Mr. Housman sounds like a truly great man, along with his wife and the “family” they raised. When I was married, I never hoped for silverware… the only silver I ever got was a spoon here and here in an antique shop. 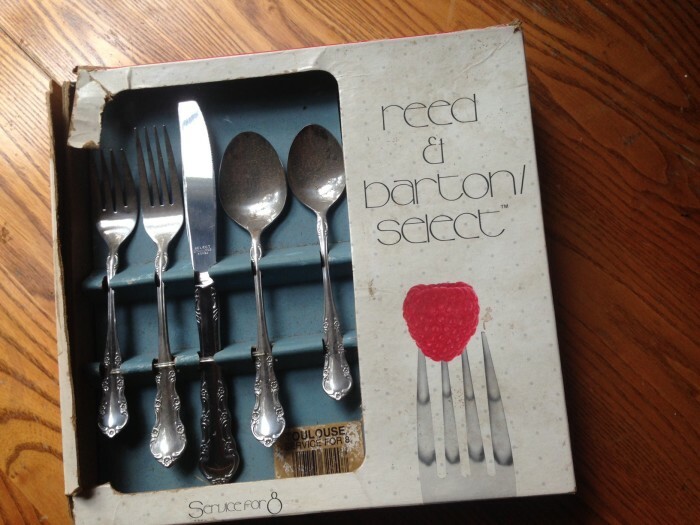 I actually love the set you have… and it was one on my wish list of flatware. The seed of a dream was also quite generous. I look forward to hearing the rest of the story. It seems to me that quite often, people are not what they might seem to be at first glance. Much like a good book. I googled “Toulouse” to try to find this set, and it was surprising anything came up :). It looked a lot like what I registered, Louisiana by Oneida. You’re so right…people are often not what they initial impressions suggest. Which is sometimes good and sometimes not so much :). What a great story! He sounds like quite a learned man-worldly knowledge!! In my life I have met some interesting people also. While working at a temporary job I met a nice woman who took an interest in me. You see I have some hearing loss and that has made it a little harder on me. She sensed that and on my last day there I was handed a card from her and in it was $100 bill. She wrote a nice note! To this day I still have that card. God puts good people in our path for a reason. Mr. Houseman was in your path–perhaps to teach you about life! Mr. Housman taught me a lot of things indeed :). I looked and looked for his post-it note; I’m sure it’s squirreled away somewhere but I couldn’t find it. I love that you have your friend’s card still. THAT was a kind gift from her to you, one that encouraged your heart…and bank account :).